Objective: Gut microbiota is currently targeted for various diseases especially metabolic disorders such as diabetes. Our strategy is to alter gut microflora via specific antibiotic to reduce load of inflammation in the liver that increases as a result of high carbohydrate diet. Th1, Th17 and Treg are important immune cell types which decide the type of inflammatory response. 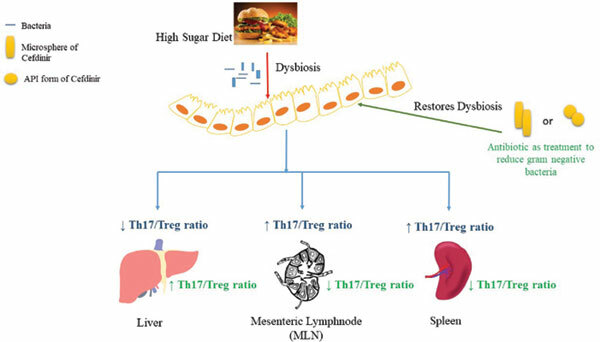 Liver is tolerogenic in nature with low Th17/Treg ratio. In diabetics, this ratio decreases even more, and can cause liver trauma. Method: The present study tries to find relationship between gut flora and immune cells such as Th1/Th17/Treg and their role in liver metabolism using diet induced diabetic mice model. Result: Upon alteration of flora using Cefdinir in different forms, one could help lower the level of Treg cells thus increasing the ratio. Gut flora is strongly associated with the immunity in the liver. Targeted alteration of gut flora helps us to restore insulin sensitivity. Conclusion: Colon targeted Cefdinir gives more promising results, opens colonic bacteria as target for improving gut, liver inflammation and insulin sensitivity. Diabetes, inflammation, Th1/Th17/Treg cells, gut microflora, cefdinir, high carbohydrate diet.